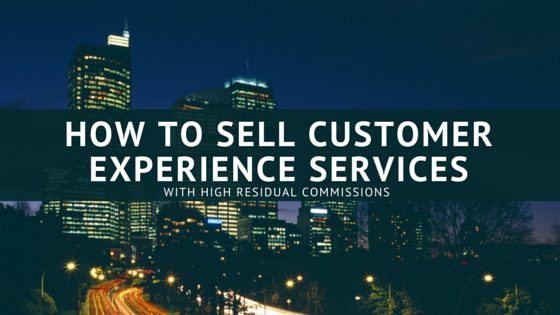 In a nutshell; if you already sell to companies that have existing customers or you're simply looking to add top class Customer Experience services to your portfolio, self-employed sales agents will benefit greatly from a relationship with this Company. Please give sales agents an introduction to the customer experience industry. The best definition we’ve heard and one we use when we speak to people is that ‘Customer Experience’ is everything your brand does for your customers, everything your business processes do to them and how it makes them feel. Customer Experience design is the art and science of shaping experience for customers so they appreciate it, remember it and share it with their friends (or family). Customers are at every touch-point of your business…it’s not just about customer service! Customer Experience or ‘CX’ was the key to any successful business back in the early 1900’s. It was lost when the academic formulas and theories came into place to help the industrial age. CX was rediscovered in the mid 2000’s. I was lucky enough to work with many SME’s and corporations in Australia where the reputation of my work through my MBA projects got around and I was in demand to help businesses increase their profits and solve their business issues. Through these experiences and working in corporations where some have so much bureaucracy that changes for the greater good of the company weren’t being allowed, I decided to start up an agency where SME’s could potentially compete with larger organisations and to give SME’s the same tools that some larger organisations use. This is not to say we don’t work with larger organisations but it would be on the basis that our recommendations would be adhered to otherwise, what’s the point? As briefly mentioned we work with Small to Medium-Sized Enterprises in any sector, especially those that keep a record of their customers. It might be a surprise to people when we say ‘any’. The reason being is that when we get customer feedback, the expert of that business are the customers; they are the ones who tell you what the real situation is in terms of their experience not what the business owner/entrepreneur thinks so we don’t need to be the expert in any/every industry – we can work in any sector. We’ve worked with Physiotherapy Clinics to membership organisations, to vets, to an Asbestos company, to banks etc. It’s so varied but yet the purpose can be very much the same when clients approach us; to find out what customers really think of them, to understand reasons for profit stagnation, to increase the share of their customer wallet and ultimately, to make more money! Why would self-employed sales agents have an edge selling your services? Freelance, Commission-only sales agents have an edge with us because they’ll be selling a proven and re-emerging service, on a win-win basis. Remember, we guarantee to increase your clients bottom-line, that's a pretty powerful sales tool. Where do you see customer and brand experience going in the future? Customer and Brand experience is an essential part of business now due to technology and the fact that Social Media now gives anyone a megaphone to voice their praise or concerns. Throughout history people have always made personal, word of mouth recommendations and it’s the most powerful form of marketing for any company. Additionally, many business intelligence reports state that customer experience in the next 5 years will be incredibly important to the business world. E.g. ‘Customers 2020, a report from US customer intelligence consulting firm Walker, looks at the Customer Experience industry of the future. The report states that Customer Experience is the next brand differential and by 2020 it will overtake price and product.’ – Business Review 2014. We see it over and over again, companies that ‘get it’ and focus on their customers experience are the ones that always out-perform their competitors. Just look at the likes of John Lewis who always try to focus on giving good customer service and experience. Another example is Zappos.com (a clothing and shoe retailer in the US) who were bought out by Amazon in 2009 for upwards of $928 million (in other reports it was over $1billion…not bad for a company that focused on being customer-centric!) Their CEO; Tony Hseih is a big advocate for customer centricity and if you look at their company website, you can read thousands of fantastic customer reviews – it’s truly phenomenal and a great example of when it’s done well, it can be highly profitable and be of benefit to both staff, business owners and customers. What make your Customer and Brand Experience services unique and innovative? We use existing and developed our own financial metrics to help us link customer loyalty and satisfaction – so we don’t pull answers from thin air or based on theories; it is scientifically and statistically valid results based on designing and asking the right questions bespoke to each of our clients. We guarantee to make our clients more money and it’s a promise. Who makes promises like these? We’ve come across businesses that make promises but will never guarantee their work. Our promise is, if we don’t make our clients more money than they invested in us we will refund the difference. We also offer a 100% money back guarantee. Again not many people can make promises like this but we are confident in the work we do and the results we’ve had with clients we’ve worked with in the past. We make sure that everything we do relates to the bottom line – how is the activity that we are undertaking going to make our clients more money? Or more time? Or to stop ‘fire-fighting’ in the business? Whatever their objective is we provide the solution and if there is something that we can’t help a business owner with then we refer them to the trusted people who we know can help – we always have people’s best interests at heart. I have been lucky to be doing this for over 15 years in both Australia and the UK and as mentioned before, we’ve worked in a variety of industries and sectors that have provided invaluable experience. Our ‘gift’ is that we are able to correctly identify the root causes of the problem and get right away to fix the problems with the right solutions. What are you plans for the future of your company? We are looking to expand and work with more companies in the UK but also increasingly helping businesses abroad, especially in emerging economies that are hungry to succeed. We serve both service and product based businesses. The advantage of some of the work we do is that it doesn’t need us to be present on location so we can do business and communicate via Skype or any other video-conferencing facilities. Why is client feedback so important for companies? It’s so important because in order for businesses to really understand how they are performing they need to gather feedback. More importantly, what areas of your business do you need to improve that will increase customer loyalty? How do you know if your customers are recommending you? How do you know if they like what you’re doing? How do you know if you need to improve on what you’re doing if you don’t ask? Have your customers left you for your competitors? And if so, why? There are so many elements that can sometimes be overlooked. It may seem obvious to ask these questions, but it’s surprising how few companies don’t do it or if it is done, it’s done badly. Some people might have a pre-conceived notion of the traditional survey and have probably seen examples of them done very badly! We do ours the correct and most useful way. The great thing about us is that we are a third party, so when we get our clients customers feedback (with the right questions, of course) we get honest feedback as some customers might not feel comfortable telling the company directly how they feel – this can be a big misconception, as well as what business owners think their customers think of their company. Interestingly, Alex Lawrence writes in a Forbes article regarding Customer Retention that, “according to statistics provided by Bain and Co. in the Harvard Management Update, 80% of companies surveyed said that they offer superior customer service, but only 8% of their customers agreed with them.” Enough said! What are the downsides of not investing in customer brand experience? As mentioned earlier, people talk and are more than ever becoming vocal about their experiences with a company – we’ve all seen it from Trip Advisor to Twitter – people tend to spend more time speaking negatively about their experiences if they’ve had a bad one, than the positives and the praise. If this doesn’t get tackled - generally speaking - with the exceptions of a few industries, people vote with their feet and will try your competitor and they’ll certainly let others know about it. Business owners could also lag behind their competitors. In an evermore-globalized world where the world seems to be getting smaller through technological development and an increase in competition, business owners should do everything possible to stand out and deliver on the promise of the brand. Once a company over delivers on their brand promises (of course feasibly, but this can also be done in small ways that can be impactful) and the customer feels they are being looked after, they end up being your best advocates and it’s just more profitable and makes business sense. Studies have shown that those who implement good customer experience strategies including referral marketing outperform their competitors by 300%. Customer and brand experience affects the top and bottom line. The business owner who ignores this fact could endanger his or her own business and their customers. We are passionate about what we do and we know the importance of the information we provide. It’s as important as saving people their jobs, saving people heartache and stress because we can identify what the problems are. Once the customer and brand experience is designed properly amazing results happen. one of our clients were unsatisfied with the amount of people using their services and wanted to find out why. Through our investigation and analysis they have now increased their monthly trading revenue from £10,000 to over £40,000 in 2 months. Another client of ours had a dissatisfied customer who spent £2,000 annually with them, we managed to turn around their experience and now they spend £16,000. Again, this customer was dissatisfied and was ready to leave and they ended up spending more! Another one of our clients was unsure how they were going to add real value and create a USP. Through our analysis they are now creating more value to their intended client base and now are receiving an improved revenue stream as a result. An additional £30,000 a year. We have many more examples but these examples highlight the importance of having and using data to understand what the situation is with your customers before making the necessary changes. Furthermore, these examples are from the customers’ side. Another and most over-looked area is the employee engagement side. We have heard of the horror stories from people who work for a company that does not respect customers. The staff are miserable and often do not perform to maximum levels. Without employee engagement, the business can be vulnerable. We believe collaboration with others is one of the ways shaping business right now and will continue to in the future. We’re still a relatively young company and we’d like the idea of getting the message out about what we do with talented independent sales agents who can see the importance of what we do. We like the flexibility and the fact that sales agents are doing things on their terms which gives us confidence that they know are great at what they do. We’re excited about how CommissionCrowd is changing the industry to allow this kind of collaboration to take place and we’re excited to grow with sales agents who want to grow with us.